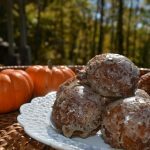 Celebrating a fall wedding or Saturday tailgate these bite size Pumpkin Spice doughnut holes with Cinnamon Glaze will be a big hit. The crumb is tender with the right amount of cinnamon, cardamon and ginger.. the trio of fall flavors. The doughnuts are fried and not baked but that is what makes the doughnuts soft in the middle. Doughnuts can be made ahead and frozen with out the glaze. 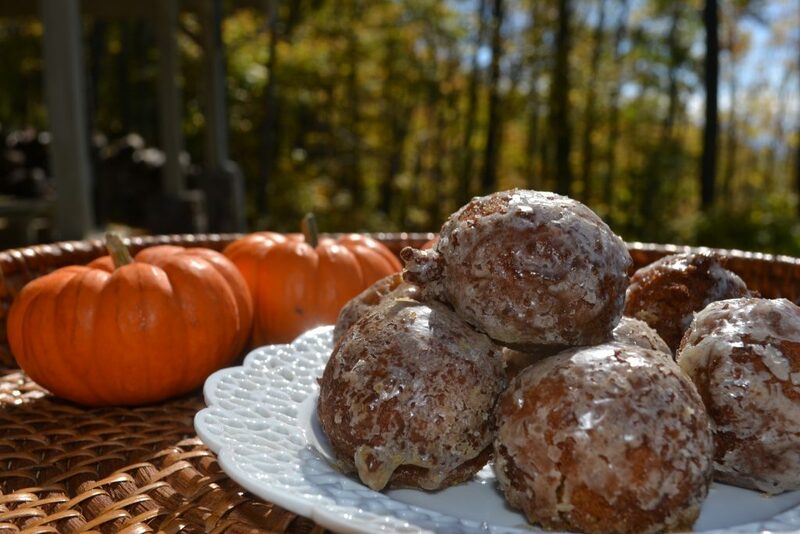 For more Fall ideas check out the Hot Chocolate Bar and Mini Pumpkin Doughnuts. In large dutch oven, pour oil to a 3″ depth. Heat oil over medium high heat to 375 F. Preheat oven to 350. In medium bowl, sift together the first 6 dry ingredients. In a small saucepan, heat pumpkin puree and brown sugar over medium high heat to remove some of the pumpkin wetness and to develop pumpkin flavor. Stir as to keep from burning 3 minutes. Remove from saucepan into a medium sized bowl. Allow to cool. Add to the pumpkin mixture, the eggs, and syrup, stir to combine, then whisk in dry ingredients until mixture is smooth. Using a 1-1/4 inch spring-loaded ice-cream scoop, carefully drop pumpkin batter into hot oil and fry until golden brown. Drain holes on paper towel lined baking sheet to remove excess oil, then place on another parchment lined baking sheet and place in oven for 10 minutes to continue baking or until center of doughnut is done. Remove from oven. Place holes on wire cooling rack on top of baking sheet to catch glaze. Pour cinnamon glaze over the warm doughnut holes. Let cool completely. Store at room temperature for up to 3 days.. if they last that long. In a small bowl, whisk together all ingredients until smooth. Pour over warm doughnut holes.